It’s a traditional Irish pub that’s been open just a few months but has plenty to offer! Langton’s Irish Pub is now open in Carmel City Center and is a multi-level pub that features varied seating and a bar on both levels. 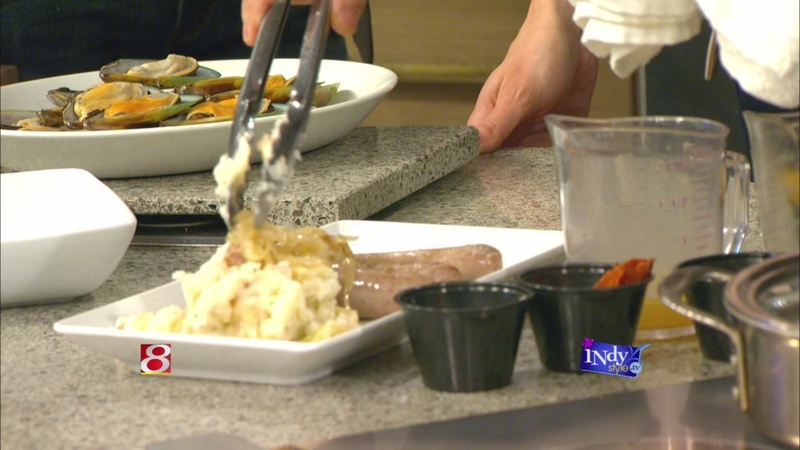 Chef Paul and Chris Parker stopped by Indy Style to make a few of their signature dishes! The Pub’s lower level offers more relaxed seating and the upper level offers more of the authentic Irish pub experience, but there are nooks and crannies to explore on both levels with a total of 6 snugs that offer an intimate dining experience. Langton’s Irish Pub, a casual dining experience, features Irish and American cuisine as well as Euro Beer on draft. Menu items range from authentic Cottage Pie, Fish & Chips, and Guinness Beef Stew among others. In addition to fine Irish food, Langton’s features live Irish entertainment, 26 draft beers and has 31 TVs throughout the Pub so guests are sure to catch the latest soccer and rugby matches. A unique feature of the pub that guests will enjoy along with its Irish dining and drink selection will be its one-of-a-kind bar and other millwork that was constructed in Athy, Ireland just for Langton’s Irish Pub. It occupies a 3,901 square foot space on Carmel City Center’s plaza level directly south of Matt the Miller’s Tavern on Range Line Road.